Sugar Loaf is a feminized Marijuana strain with a vigorous growth being very strong and with an excellent flowers/leaves ratio. It also produce an impressive amount of resin. Sugar Loaf is a feminized Marijuana strain created by crossing an Indica mother brought from Pakistan and the best Capricho male (one Manali hybrid x Stabilized Colombian) from Cannabiogen's collection. This cross has resulted in a F1 hybrid Marijuana with an incredible power. This Indica/Sativa Marijuana combination results in plants with a vigorous growth, very strong, with an excellent flowers/leaves ratio and a surprising resin production, giving the impression that the leaves are frosted. 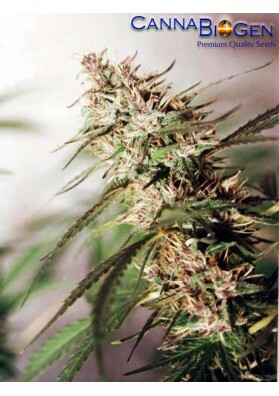 It has a characteristic Indica taste but its effect is more Sativa, being sitmulative and durable. Sugar Loaf is highly performant and suitable for indoor and outdoor cultivation. Cannabiogen recommend the use of a ventilated cultivation room and some kind of supports to the buds, due to its compact-sized flowers that fatten much at the end of flowering and for being quite suscceptible to pests and fungi. For this Cannabis strain, Cannabiogen recommends a vegetative cycle of 20 to 25 days.